Santorini is famous for its sunsets but it is also known for its wine. There are 13 wineries on an island that is only 11 miles long and 7 miles wide. White grapes make up 80 percent of the grapes grown on the island. And, of the white grapes, they are predominantly assyrtiko, with a small percentage aidani and athiri. Assyrtiko is indigenous to Santorini, but is also grown in other parts of Greece. It is a white wine that tastes like a red grape and can be vegetal if picked too young. 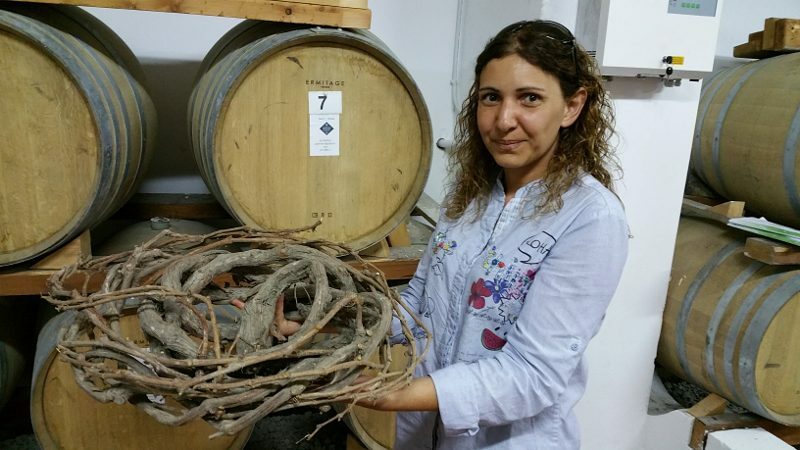 Assyrtiko produces a wine with great aging potential, but very limited aromas. Assyrtiko ranges from austere minerality and acid to caramel and oxidized notes. However, the wine is not oxidized. In fact, malolactic fermentation does not take place in any of the white wines of Santorini. There are three PDOs (Protected Denomination of Origin) in Santorini and all three are white wines. PDO Santorini is a minimum of 80 percent assyrtiko, and 20 percent can be either athiri or aidani. PDO Nykteri is the same as PDO Santorini but must spend at least three months in barrel (it can also be barrel fermented). The name Nykteri means “working at night” as historically the grapes were pressed at night. PDO Vinsanto, not to be mistaken for Italy’s Vin Santo, must be at least 50 percent assyrtiko, and aidani is added for fruity aromatics. After picking the grapes, they are left in the sun to “burn” for 5-10 days. Although Vinsanto is made with white grapes, it is a caramel brown color. What makes Santorini all the more unique are the vineyards. Instead of trellises, the vines are grown in what is called a kouloura, which means circle or basket. The basket is formed to protect the grapes from hot sun and strong winds. Many of the vines are more than 150 years old. The baskets are not planted in a straight row because new vines are grown from the branch of a basket. A vine branch is replanted into the ground and sets its roots where it wants. Once it has set its roots, it is disconnected from the original basket. The vines are then wrapped in a circle with rocks placed below for aeration. The baskets must be hand-harvested and result in smaller yields. The acidity of the wine comes from the soil of Santorini, which is volcanic and sandy. 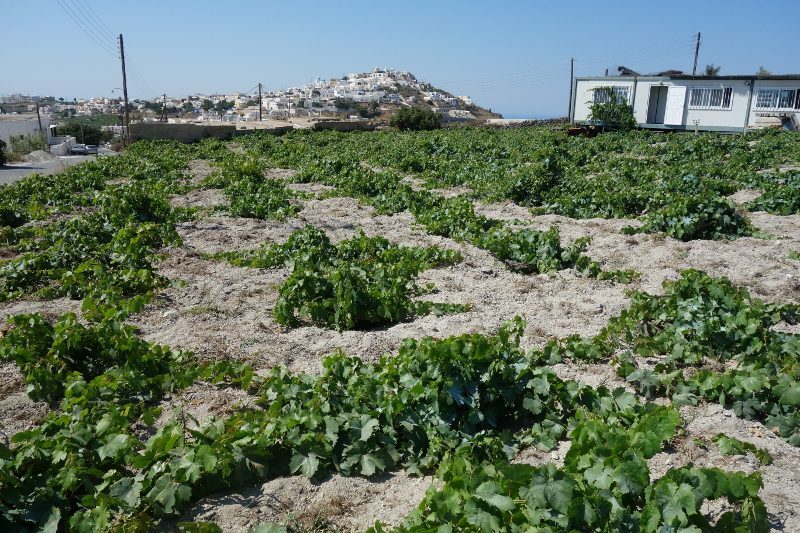 All of the vines are on un-grafted rootstock because Santorini was never affected by phylloxera. The roots go very deep, seeking water that is stored in the pumice stone. In Santorini, the vineyards are not very big. Any given vineyard is approximately one hectare (2½ acres) and typically the number of hectares a winery owns are not all in the same location. This entry was posted in Lifestyle, Travel, Wine and tagged Assyrtiko, Boutari, Gavalas Winery, Greece, Hatzidakis, kouloura, Napa Valley Register, PDO Nykteri, PDO Santorini, PDO Vinsanto, Santo Wine Cooperative, Santorini, Sigalas, Venetsanos, white wine, Wine, wineries, winery by Allison Levine.